I did not know much about Gold Hill Winery other than tasting their wines on occasion at various events in Vancouver. I received some of their wines to taste and write about, so I delved into their website to find out more about them. 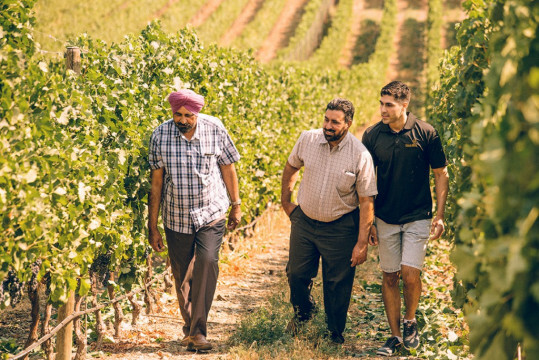 From their website, Gold Hill Winery opened in 2009 by brothers Sant and Gurbachan Gill, are originally farmers from the Indus Valley region in Northwest India. They saw the climate of the South Okanagan was similar to where they grew up and recognized that it would be great for growing fruit. Sant moved to B.C. as a 20-year-old. He moved to the Golden Mile fruit belt and his younger brother, Gurbachan, soon followed. The brothers grew grapes for a number of wineries from their home in the vineyards. In time, they bought land and planted vines. They called it Gold Hill because of its location along this famous stretch–and because they wanted to produce the very best wine possible, the Gold standard. They partnered with winemaker Philip Soo (who founded Bonamici Cellars). The family owns 65 acres of vineyards in the Okanagan Valley with 24 acres on the Golden Mile and 32 acres in the heart of Osoyoos. As a preface to my tasting notes, I should note that 2014 was a very hot and long growing season in the Okanagan so that grapes could reach full maturity. It was also very dry in the interior, with little rain. I read that there was only 11mm of rain between July and September in Kelowna and less as you went to the south Okanagan. These factors help to create the big red wines below. 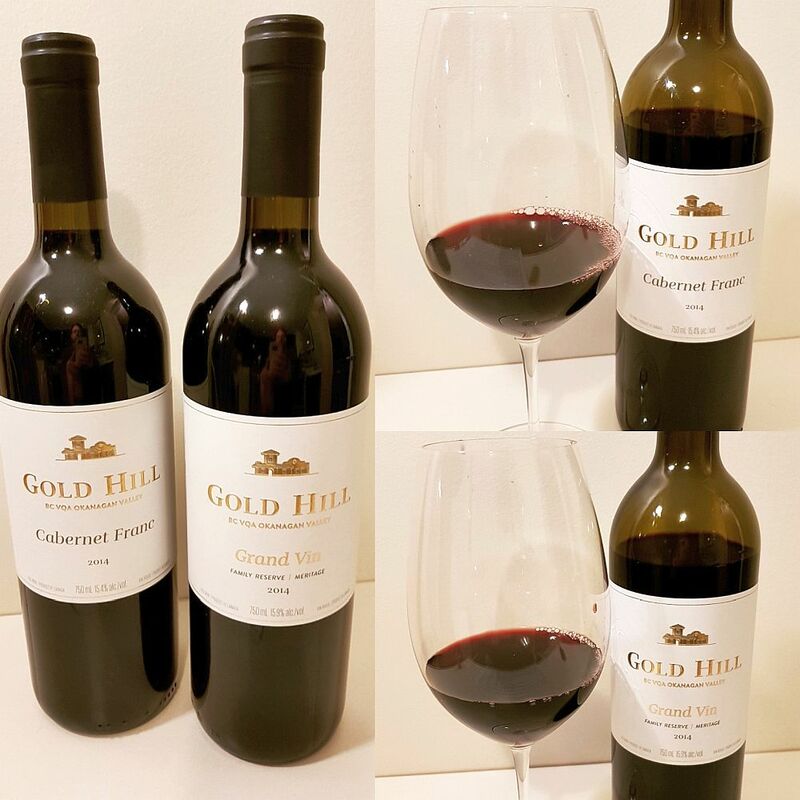 Gold Hill Cabernet Franc 2014 ($34.99) – Very deep garnet in colour; almost opaque in the glass. It has deep aromas of blackberries and peppery spice, along with a touch of red cherries and lees. With decanting, the lees disappears, and you get some cedar and tarry notes on the nose. The wine is dry and round with a fuller mouthfeel. Ripe dark fruits mainly on the palate with lesser amounts of black cherries, ripe plums and touches of oak and dark chocolate. Medium tannins and acidity. With decanting you get some capsicum and tarry flavours, and stronger and dark chocolate flavour. I didn’t detect any cedar notes on the palate, which you usually get to some degree with Cabernet Franc. The wine finishes hot, with dark fruit and peppery flavours, and a hint of vanilla at the very end. 15.4% alcohol, with shows that this wine was made from really ripe grapes. Maybe a little too ripe. Rating: – A bigger dark fruit wine on the nose and palate along with peppery spice. Gets some tarriness on the nose and palate with decanting. May not age too long so drink now. Gold Hill Grand Vin Family Reserve 2014 ($64.99) – Another wine that had grapes with lots of time to ripen. This one comes in at 15.9% alcohol. The resulting look is an opaque black-garnet wine in the glass. The nose is a little closed, with aromas of dark fruit, a hint of vanilla and some tarriness. The wine is big with a round mouthfeel. Medium acidity and tannins that start off silky, but get stronger toward the finish. Bigger intensity fruit flavours; mostly black fruit, followed by black cherries and ripe plums. With decanting you get the addition of raspberry flavours and the wine becomes quite peppery. I also noted some floral perfume. Medium plus length, finishing with drying tannins on the tongue, and a mix of tart and bitter dark fruits. Some pepperiness and cedar at the very end. I think with the stronger tannins in this wine that it could become quite interesting with 3-5 years of bottle ageing. Rating: A deep dark black-fruited wine with a big mouthfeel. You can drink it now, but I’d suggest giving it a few years in the bottle for the wine to develop some tertiary flavours. Gold Hill Syrah 2014 ($34.99) – Again a wine that is dark and powerful, coming in with 15.6% alcohol, but with more finesse. It is an opaque mix of ruby and garnet colours. It was quite interesting as I poured this wine it was thick, dark and curvy in the glass; you could say a sensuous pour. It has a lighter intensity nose, with red fruit and meaty aromas, and a touch of black and green peppercorns and chocolate. It is very slightly off-dry, with medium acidity, but very full-bodied. Round and silky in your mouth, mouth-filling, with flavours of ripe cherries, raspberries, plums, and black fruits. There are also some sweet spices hints of perfume, milk chocolate, and oak. The wine has a long length, finishing with chocolate, black fruit, black cherries, and some chalkiness and nutmeg flavours. The tannins are stronger on the finish as well. Top notch. Decanting did not improve anything in the wine, so open and enjoy. Rating: – – A top quality big red wine. Everything is in harmony. Intense deep black and red fruit flavours. 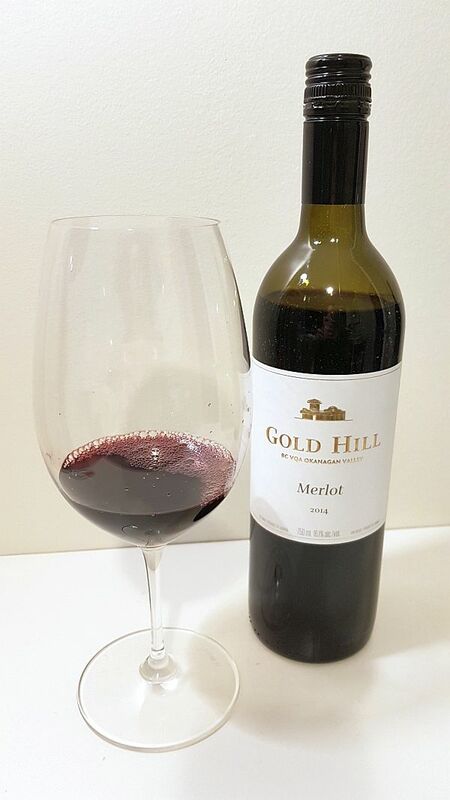 Gold Hill Cabernet Merlot 2016 ($24.99) – Down to 13.8% alcohol and it shows in the glass and on the palate. |The wine is a medium translucent garnet in colour. Beguiling medium intensity aromas of nutmeg and allspice, ripe sweet red fruit, in particular raspberries, along with blackberries and ripe plums. The wine is dry, but very silky and has a thick mouthfeel. A mix of ripe red (less) and black (more) fruits, plum, along with a touch of oak, then sweet spices toward the finish. Also a touch of dark chocolate, but this lessens with decanting. Fine tannins and medium acidity. There is oak but it becomes more noticeable toward the finish. Medium plus length finishing with tart black fruit and pepperiness. The tannins are firmer with decanting. Easy to love this wine. Rating: An easy to love red Bordeaux blend. Very silky and thick mouthfeel, with primarily black fruit flavours, but also red fruits, and an interesting nose with a mix of sweet spices and ripe sweet red fruit. No need to decant. 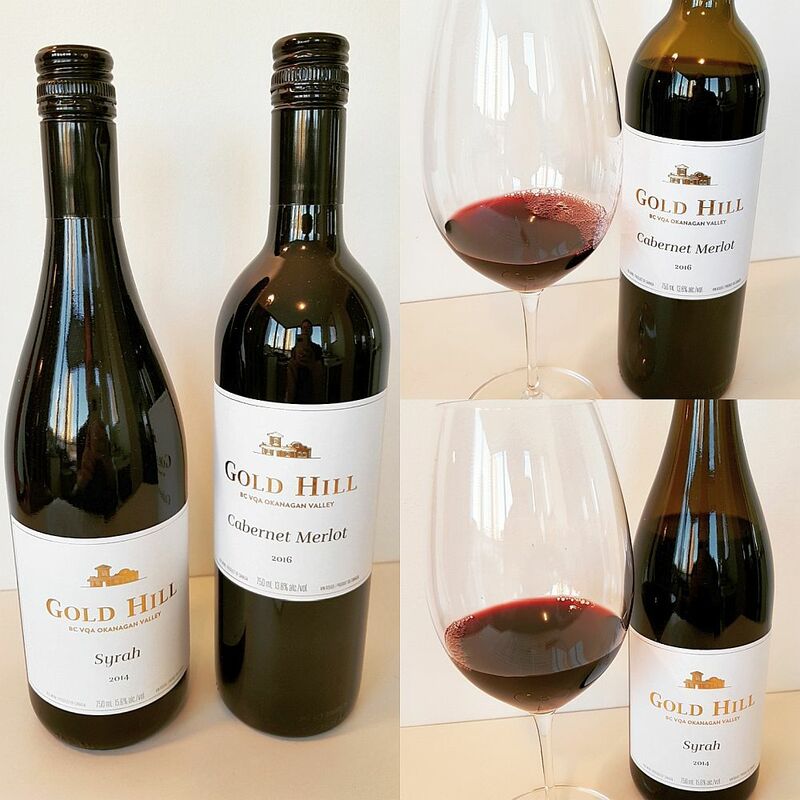 Gold Hill Merlot 2014 ($34.99) – This wine comes in at an amazing 16.1% alcohol. It is opaque, almost from core to the rim, garnet coloured. The wine has a medium intensity nose, with ripe, dark fruit, black currant dark chocolate, some dustiness and a hint of oak, and leather at the end of the aromatics. With air, I also picked up some black tea leaves and sweet spices on the nose. The wine is dry, round, with fuller mouthfeel and flavour intensity. Medium acidity and medium fine tannins. The wine flavours are primarily dark, ripe dense black fruit, along with some red fruits, ripe raspberries, and oak. With decanting the red fruit component lessened. The wine has a longer length and gets spicy and peppery, along with some bitterness. The dark fruit flavours continue to the finish. The tannins get a bit grippier and at the same time, you get some acidity to balance it out. A wine with 4-5 years of ageing potential. Rating: – A big wine with dark, dense black fruits on the nose and on the palate. Some red fruits in the background to help add some flavourful interest. Finishes peppery, with grippy oak and bright acidity. This wine can age for 4-5 years. You can purchase their wines through the Gold Hill Winery website. Their 2016 Merlot is available at 2 BC Liquor stores.